This book focuses on EMDR Therapy as a psychotherapy approach based on standard procedures and protocols for trauma and stressor-related conditions. 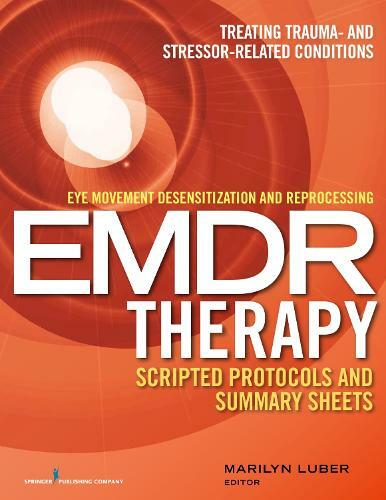 Using EMDR Therapy's standard procedures and protocols as its template, this book presents step-by-step scripts that enable new practitioners and seasoned EMDR clinicians, trainers, and consultants alike to incorporate EMDR Therapy into their case conceptualizations and treatment plans while working with patients who have issues related to trauma, and stressor-related conditions. These scripts can be put to use immediately and retain the complete integrity of EMDR Therapy by presenting the three-prong protocol (past memories, present triggers, and future templates) and the 11-step procedure essential to the standard practice of EMDR Therapy. The chapters are conveniently presented in an easy-to-use manual-style format that facilitates a reliable, consistent procedure. Scripts and summary sheets are available in an expandable, downloadable format for easy digital access for each protocol to simplify the gathering of information and to document it in clients' charts in a consistent format. This facilitates quick retrieval of the essential issues and components needed by clinicians to create appropriate treatment plans.